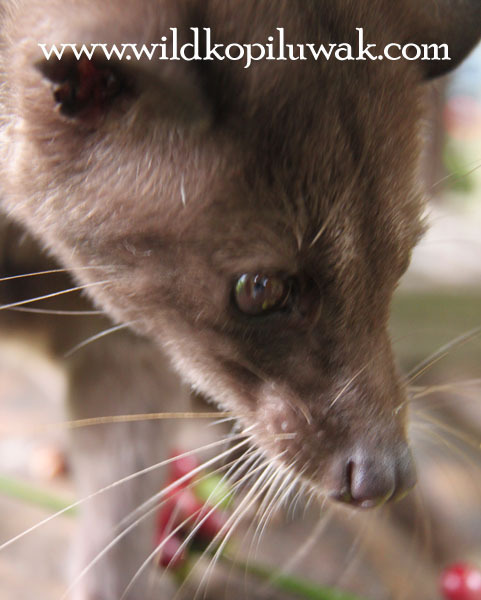 Luwak is a Javanese pronunciation means Civet, the catlike wild animal. Since 300 hundred years ago, Dutch brought the coffee beans and plants from India and started to cultivate at Java island, Indonesia. Meanwhile there already live in nature the wild Luwak animal at these highland forest, beside searching for high protein food at such habitat, they also love to eat farmer’s poultry and sweet mature fruits, especiallty new planted coffee cherries. The farmer consider these wild Luwak as annoying pests. Fortunately wild Luwak cannot digest the coffee seeds completely, they only pulp the skin, swallowed and digest the fruit layer, the remains poop out still in form of beans. During the colonial era, the farmer must handover all the coffee to the Dutch government, upon time, exist farmer collect few dropping from the floor, process and roast to consume, they discover that the the Luwak process coffee have an extraordinary flavor. Hence the Kopi Luwak legend started, This perfect cup also call “civilian and aristocrat” coffee. Wild Kopi Luwak - is a sub product categories also patented brand of Kopi Luwak produced by Maharaja Coffee，100% pure, single orgin, single varietal, and totaly wild from Nature. Inspired by a cup of kopi Luwak few years ago before decided to start a coffee business, we traveled through many coffee plantation across Indonesian archipelagos to search for truth of Kopi Luwak, the fact is amazing, the Kopi Luwak is not only the urban legend, but it was for real. No longer from now, the history of coffee of the world will have a new name; The "Luwak harvest and processed" coffee. To produce a cup of specialty exotic MAHARAJA "Wild Kopi Luwak" not such an easy procedures: Skill, art and passion are combined together to produce an excellent cup of Kopi Luwak. Enviroment friendly, ecology balance and sustainable is our policy and all made out all of our products. By analyze sample database gathered from coffee production region of Indonesia, We have conclude such a few of single origin good quality Kopi Luwak; Arabica from Sumatra Gayo, Sumatra Mandheling, East Java Estate, Celebes Toraja and Bali Kintamani, with variety Arabica, Robusta from central part Sumatra, and Arabusta from central Java also very delicate with lower in acidity. Maharaja coffee produce only rated best from selected coffee plantation located in among volcano highland, behind the evergreen rainforest where coffee and the wild Luwak animal live in equilibrium life cycle. This is the secret of our success with "Sustainable" principle. That’s why our product cupped best among others on the market. We may say that the best wild Kopi Luwak worth the price of (10 times the specialty coffee) and they are accepted widely on the market. Started from 2008, Maharaja Coffee launched first wild Kopi Luwak products line to the market after several years of research and development. MAHARAJA COFFEE's Wild Kopi Luwak was well accepted by coffee connoisseur and coffee lovers, and rated to be one of the most potential Indonesia Specialty Coffee manufacturer with many official and non-official achievements recently. During these short time on growing market, we have established the supply chain, Maharaja Coffee's products are available at more than 30 medium-up level supermarkets around Jakarta capital city, Bali and Medan. We also export our product worldwide to more than 15 countries, by air freight to keep the freshness of the products. Our coffee was drunk by routine customers throughout the world with repeated order and growing new ﻿﻿﻿﻿connoiseurs. Join us to explore the Indonesia wild Kopi Luwak and Specialty Coffee and tell your stories. Copyright (C) 2005-2012 WildKopiLuwak by Maharaja Coffee. All rights reserved.